New Orleans Saints top cornerback Keenan Lewis was born and raised in New Orleans but left home in 2004 to go all the way out to Oregon State University. Lewis had been an All-Star player at O. Perry Walker High School in New Orleans where he stared for head coach Terry Wilson to such a degree that he was offered a scholarship from far-away Oregon State to attend their school and play football for the Beavers. At 6’1” and 208 pounds, Lewis was considered to be on the small side for an NFL cornerback but he made up in heart what he lacked in sized and was drafted by the Pittsburgh Steelers in the 3rd round of the 2009 NFL Draft and was signed to a four year contract by the team. 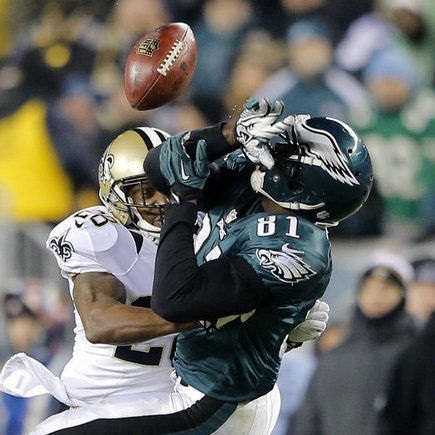 When Keenan Lewis became a free agent in 2013 he took advantage of the opportunity to go back home to New Orleans and signed a five-year contract with the Saints for a $26,300,000. Nice way to come back home Keenan. Although the Saints scouts and coaches knew what they were getting, Keenan Lewis is not exactly a household name, not yet anyway. Lewis is considered to be one of the most underrated corner backs in professional football and this season with the Saints has proven that to be true. Lewis stepped in when Saints veteran cornerback Jabari Greer went down with a season ending injury and since that time, along with Cameron Jordan, he has become one of the most effective players in Rob Ryan’s defense. His importance to the Saints was dramatized in their victory over the Philadelphia Eagles in the frigid cold of the NFL Playoffs Wildcard game. Even before the game got underway sports commentators were talking about the coming matchup between Keenan Lewis and the Eagle’s DeSean Jackson. It wasn’t very far into the first quarter before it became obvious the Lewis was shutting down one of the best receivers in the league in DeSean Jackson all together as Jackson’s production in the first half was zero. Keenan Lewis tends to be a very physical and aggressive player and Jackson was simply unable to get off of the press. But then Lewis got banged in the head and went down to the turf and the trainers had to be called out. He walked off the field under his own power but obviously dazed and the Saints doctors wisely did not let him return to the game although Lewis was pleading to go back into the game.